The automation of everyday life is not an unusual occurrence: from grocery shopping to the management of our very social life, we smoothly automate a great many tasks. Customer service automation is no exception. As customers become both more tech-savvy and more demanding, their foremost expectation in terms of service is speed. Customer service automation can help in that regard, and in others. However, the practice often gets a bad rap. This article will explore the advantages of customer service automation for your business, and detail the perils of the process as well. What are the benefits of customer service automation? Implementing customer service automation processes can have several advantages. In short, automation removes or minimizes the human element in a given area of service. This removes the potential for redundancy, wasted effort, and human error. Customer service automation can have a very beneficial effect on your team’s workflow. For instance, your help desk system can be automated to provide scripted responses to the most recurring support scenarii. This means that your human agents won’t waste time typing out the same response several times a week. The same program can also automate work flows by prioritizing and attributing tasks. These include responding to customers and following up on ongoing support situations. These small reductions in the effort expended daily by your team can add up to hours, even days, of time saved over the course of a year. Introducing customer self-service resources, such as FAQs, and interactive knowledge bases, will allow customers to solve mundane problems and answer common questions without needing the help of a live agent. These automated solutions will leave the human support representatives more time to field the extra-difficult queries. When a customer gets in touch with customer service, long wait times is a giant pain point. To shorten them, you have several options: automating support channels, or hiring more agents. The former can be achieved with the help of interactive voice recognition, or IVR. IVR lets callers interact with a voice recognition program, and direct them to the right interlocutor based on their needs. This not only saves your team time, but it also spares the customer a great deal of frustration, and gives them no incentive to churn or complain. To take it one step further, customer service automation can allow you to preemptively do away with customer’s friction points, thanks to predictive analytics. Call recording, voice recognition, and usage monitoring can help you keep tabs on how customers interact with your product, sales team, and support funnel. This lets you surveil product adoption and improve your customer retention, as well as zero in on frequent problem points in order to remedy them. The other option to reduce wait times and expedite customer service is hiring more employees. This isn’t necessarily feasible for your business. Perhaps you’re starting out and funds are limited, perhaps recruitment is slow. Customer service automation lets you operate convincingly and efficiently with a more compact team. While some automation services are costly to implement, many are available on a subscription basis. This means your support desk, your CRM software, your phone system, etc. You won’t pay for more than you use, and you’ll be able to easily scale your subscription to suit your needs. Gen Y is in the process of overtaking Gen X and Baby Boomers in both numbers and purchasing power. Soon, the oft-reviled Millennial generation will compose the largest part of the customer pool. Having borne the brunt of countless jibes, it’s obvious that this rising demographic is threatening those witnessing it. The entirety of Gen Y is often lumped together and characterized as lazy, entitled, and aloof. Another way to consider this is: as digital natives, Millennials are self-reliant, resourceful, and savvy problem-solvers. As such, they respond favorably to the possibility of automated service: 70% of Millennial women report being comfortable solving an easy issue without talking to a human, according to a Capterra study. 60% of Millennials also feel good about themselves and the company when they are able to sort out a support issue on their own. Not only are Millennials comfortable with solving an issue with the assistance of automated customer service, they also welcome the opportunity to do so on their own, with an added benefit of bonding with the brand in question. Well trained and well informed customers are less likely to even require customer support, so Gen Y’s resourcefulness is a quality businesses should embrace and enable, rather than resent. If the automation of customer service processes was both easy to implement and risk-free, then everyone would be set. That’s just not the case. There are several potential bumps in the road to a successful automation strategy. The first is an obvious caveat: when you automate customer service, you necessarily tone down the human element of your support strategy. Customers can resent having to deal with a machine. Indeed, empathy, a quintessentially human ability, is an essential part of exemplary customer service. In one example, one brand found that emotionally engaging with customers reduced attrition and increased advocacy. Let’s return to the example of Millennials. While they welcome the opportunity to demonstrate self-sufficiency, they also strongly tend to patron brands with which they’ve formed an emotional bond. This search for reliability and identification can be severely hampered by customer service automation. It can be extremely off-putting to a customer looking for advice and support to be met with an automated service instead of a human agent. Poor system design can really hurt your customer service automation system. If your IVR makes your customers go round in circles, if your chatbots can’t understand a customer’s issue, if call routing causes redundant conversations, then automation is more trouble than it’s worth. Likewise, if your various automated processes aren’t available for analysis and cross-reference, then you won’t benefit from the resulting insight and your customers won’t get qualified informed service. Customers will amalgamate your customer service and your brand. If your automated customer service leaves them frustrated of feeling taken advantage of, they’ll disengage from your brand altogether. This can be the result of poor configuration, a lack of human presence, or both. Dissatisfied customers are louder and more visible than contented ones, so the bad publicity resulting from inattention to detail can quickly sink your reputation. In order to avoid the pitfalls detailed in the previous section, here are some best practices to help your business pull off its customer service automation. How to avoid alienating customers when it comes to customer service automation? The answer is to only select tasks and processes which invite automation in the first place. This includes repetitive support cases, self-service resources, knowledge bases, checkout pages, usage monitoring, etc. These are all rather thankless tasks; your customers and your team are both better off if they’re automated. A good rule of thumb is: if a given automated process isn’t collaborative and useful to either your team, your customers or both, leave it out. Nevertheless, a rule of thumb is just that; don’t forget to cater to your precise audience. For instance, a repeat user might not need assistance with selecting a product or checking out, but a first-time user or one who returns after a long time away might need some guidance. An automated process which would save the former effort might cause the latter to feel frustrated or abandoned. Likewise, customers expect consistency above all else across the different service channels you offer. That doesn’t mean that all channels are equal when it comes to being automated. You wouldn’t go to the trouble of introducing a supplementary channel if your customers won’t use it; so don’t automate a channel if it doesn’t benefit your customers. A chatbot might be a solid idea, but it could also prove frustrating if the bot doesn’t suit the needs of the customers. One way to make automated customer service more collaborative is to merge your service channels. Information silos are a major obstacle to a successful omnichannel strategy, and the same is true for automation. If your automated channels and processes aren’t mutually influenced and affected with your human representatives’ tasks, then collaboration and efficiency will take a hit. Your customers will have to repeat themselves if they have to escalate their issue to a human agent. Or they’ll find themselves lost in an operational limbo. This lack of communication will greatly frustrate your team, not to mention your customers. Make sure that your automated processes can integrate with one another and with your other tools: such as by collecting chat logs, phone call recordings, support tickets, emails and more in a single interface for easy agent access and accountability. On that subject, customer service automation should benefit your team as well as your customers. The savings in time and funds shouldn’t lead you to pocketing the difference and neglecting the humans in your team. The extra funds and available time can be reinvested in your human team, to give them better training, better tools, and make them better equipped to work in tandem with the technology of automation. Humans are the technology’s backup, maintenance, and escape hatch. For the escalation of complex tasks and problems, humans are a necessity for your customers to receive efficient and empathetic service. Always give the customer the option to talk to a human if they’d rather take it slow. 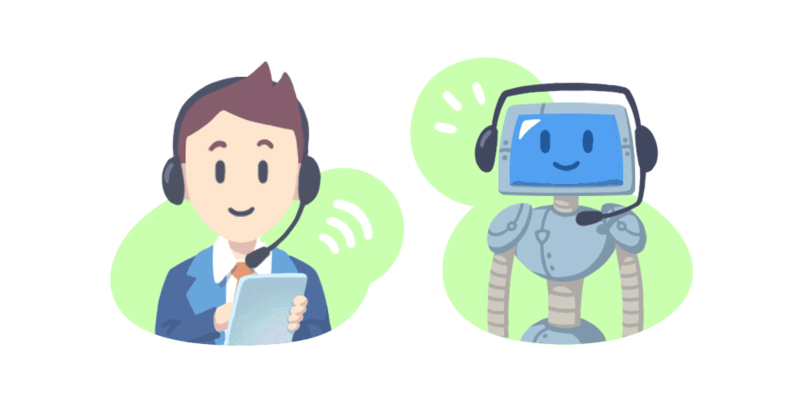 Customer service automation is a valuable tool, but it isn’t a crutch for poor management or agent engagement. Your customer service automation processes should be appreciated by your customers, useful to your team, and beneficial to your bottom line. To achieve this, they need to be up to date. Perfecting your strategy is a matter of continual testing and feedback collection. First, testing will let you stay up to date with your software and keep it running smoothly. Your technical team is responsible for the upkeep of the automation software. Second, testing is necessary to refining your automation processes. Introduce change slowly, and in small segments at first. This will let your gauge the effectiveness and popularity of these changes. It’s necessary to ask your customers for feedback when you set out on your automation journey. Giving your customers a voice is an extremely important part of any customer service strategy, and automation is no exception. By monitoring how your customers interact with the changes you implement, you’ll find out which are most welcome, and which do more harm than good. You’ll need constant vigilance, as well as the willingness to impartially consider your own methods. The learning curve is steep, but customer service automation will only ever be as successful as the planning behind it.